Day: Neely Henry Lake. There is upriver Neely Henry and there is downriver Neely Henry. Practically two different bodies of water, if they were not joined where the lake narrows at Gadsden City launch. When fishing during the week water generation is usually going off and on both at night and during the day. Call 1-800-lakes-11 for schedules. Upriver bass gather where the current breaks across islands, points, creek mouths, around bank cover such as piers, boathouses, stump rows, standing timber and a number of rock bluffs. 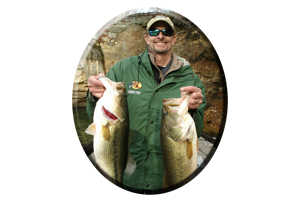 Both spotted bass and largemouth bass will gather in huge numbers, holding in eddy areas, just waiting for some lucky (or knowledgeable) angler to discover. Finding these current-oriented bass involves some lake knowledge and often quite a bit of searching and fishing. However, your search can bring a needed break when its hot and the running cools you off. Check out the aforementioned main river areas. Fish with deep-diving crankbaits or Carolina-rigs and Texas-rigged plastics around creek mouths, blow downs and points. Or if flipping and pitchin’ is your thing, then all the wood and rock cover needs probing. Heavy jigs with oversized trailers, get the big largemouth bite these upper lake headwaters are so noted for. But don’t rule out medium-to-large sized tube baits, gitzits and grub-type lures for both species of these often picky largemouth and spotted bass. Spinnerbaits with #6 to # 8 size Colorado or Willow leaf blades (often in tandem, or one big, willow leaf blade behind a smaller, Colorado blade), gets good results, especially when confronted with moderate-to-fast moving current. Downriver, aside from all the recreational boat traffic on weekends, there are many places to have all to yourself on Neely Henry Lake. 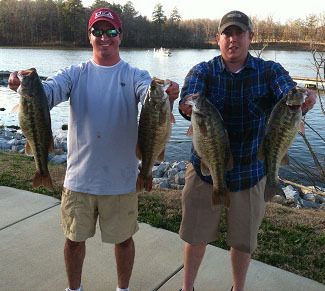 Huge feeder creeks such as Canoe Creek, Beaver Creek, Shoal Creek and Bridge Creek, offer many small cuts and pockets. Canoe Creek, the biggest feeder on the lake, stretches for miles far back in the countryside to branch off into many pockets, flats and backwaters. All of these mid-to-lower lake areas have piers and boathouses that harbor shade-seeking bass all summer. Around most of these vertical structures (excluding ladders and cross members) are resident-planted brush piles and you often find more than one bass. Most piers deserve many casts, with several types of lures, from many different angles to thoroughly fish them out. 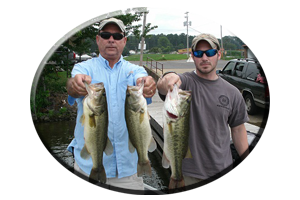 Upriver and downriver, look for schooling bass this summer, be ready with long casts, and heavy lures, usually inevitable for these surfacing bass. Many of these schoolies are spotted bass, white bass and largemouth’s, but some hefty-sized stripers (10-30 lbs) are always in on the action. 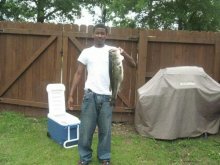 * Be ready with stout tackle, strong Trilene Big Game line, a good rod and reel and a good net. You can fish several different ways at night on Neely Henry Lake. From mid-to-downriver you will see a lot of piers, marinas and other well-lit areas. Feeding at night, these bass will hang around these man-made structures and they hang around all the resident-planted brush piles. You can always fish worms, lizards, plastic crayfish, tube baits, or jig combos, but other lures normally associated with daytime fishing can be utilized. 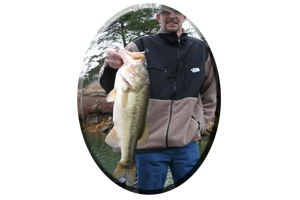 Casting into well-lighted areas with soft and hard jerkbaits, crankbaits, spinnerbaits and even rattletraps, will draw the bass in for the kill. Many of these bass will hang just outside the realm of light and ambush baitfish as they come out from around these piers and brush. Stripers will also hang in this realm of light at night. 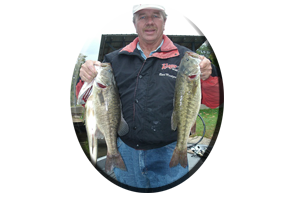 Topwaters, such as jitterbugs, baby torpedoes, zara spooks and buzzbaits get their share of Big Bass “explosions” in the night. Getting the right angle and sometimes having to cast many times to the same spot, may be the ticket to getting bit from these weary, nighttime bass. Many flats, feeder creeks and small pockets, make up the lower end of Neely Henry Lake. Some of these backwater areas are found far back in the woods under the security of a dark, secluded night. With clear water these bass will forage into some very shallow water, water that you could not even get a bite in during the day. Some of these backwaters have many types of aquatic grass. Fishing weed less lures in and around these oxygen-producing hideouts can bring explosive strikes during the night. Three lures come to mind when fishing these weedy areas. The old standby, the worm, is always good for a few bass. Always include worm rattles, fish attractants and sharpen or replace any worn out or dull hooks. Gamakatsu brand hooks are suggested. Fish with bigger worms featuring tails that have a lot of action. Stick with darker colors of black, purple, brown or combinations of brighter and darker, contrasting colors. Two other weed less lures are the spinnerbait and the buzzbait. Hang-ups are less likely when throwing these lures up on the bank, in trees and around weeds, than when fishing with exposed treble hook lures. The blades of a spinnerbait, emit lots of fish attracting vibrations. Blades also create flash, and some spinnerbaits have rattles. Choices of willow leaf or Colorado blades are a matter of personal preference. Most anglers will agree, the Colorado blade puts out more vibration. Single, Colorado blade spinnerbaits in 1/2 to 3/4 oz. weights are best for dropping, slow-rolling or waking the lure just beneath the waters surface at night. Blade sizes of #5 to #8 are popular for night fishing and provide a much better “feel” of the lure. Short arm models are better felt. Buzz baits are annoying to shallow water bass and often, the noisier the better, to assist them in tracking down these intruders. Clacker-type buzz baits either have a small flag that hits against the blade, or the blade bumps against the head of the lure. One quarter to half ounce models are the norm. In some instances, bass prefer a much quieter buzz bait. Some buzz baits, with holes drilled in the blades, emit sounds similar to a school of surface-fleeing baitfish. On both the spinnerbait and buzz bait, trailer hooks are a must. Many bass will just slap at these lures with missed strikes common, especially after dark. With all of these nighttime offerings, sharp hooks, stout equipment, quality tackle and at least 20 pound test Trilene Big Game line, are a must. 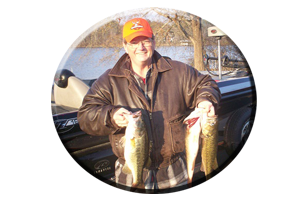 Upriver on Neely Henry lake, fishing the mouths of creeks and small pockets, is always a dependable tactic for bass coming and going from shallow to deep water, especially during late evening hours and at dawn. From midnight to dawn, check out the stump-filled flats in the backs of these small feeder creeks and backwaters, for some shallow feeding bass. All of these tips will work during the summer, for conditions rarely change and bass will usually remain in the same areas.